How Can I Stop Squirrels From Eating the Lead Vent Stack Covers? 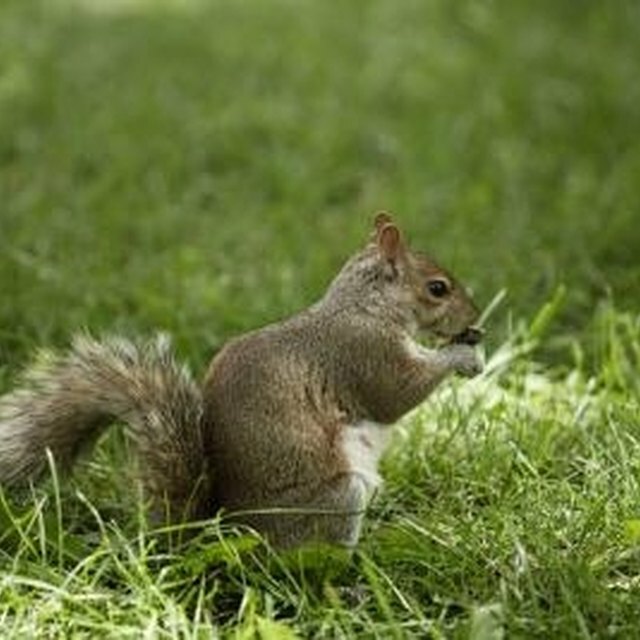 Squirrels usually eat plant materials such as fruits, nuts, berries, fungi and corn. When they don't have access to their preferred foods, they sometimes chew tree bark. While squirrels don't actually consume lead vent stack covers, they sometimes cause gnawing damage. You can modify the area to prevent squirrels from gaining access to your lead vent stack covers. Also, applying repellents imparts an unpleasant taste to the covers, deterring squirrels from gnawing on them. Squirrels can cause gnawing damage to building materials. Cut off tree branches that hang over the lead vent stack covers to prevent squirrels from using the branches as launching points to reach the covers. Lay a 2-foot section of lightweight plastic pipe 2 to 3 inches in diameter on a stable working surface. Slit the pipe lengthwise, spread it open and place it over wires that squirrels travel on to reach the lead vent stack covers. Place as many plastic pipe sections as you need to cover the wires that squirrels travel on. When squirrels step on the pipe, it will rotate and the squirrels will lose their balance. Build a fence around the lead vent stack covers using 1-inch mesh wire. Erect the fence about 30 inches above the vent stack covers to exclude squirrels. Paste masking tape on surfaces where squirrels travel. Spread a squirrel repellent containing polybutenes on the masking tape. Polybutene is a non-drying, sticky polymer used to repel birds and squirrels. It comes in gel and liquid formulations and is available at pest control suppliers. The sticky material deters squirrels from walking or climbing on the treated surfaces, according to the University of Missouri Extension. Apply a chemical squirrel repellent containing Thiram to the lead vent stack covers. Thiram makes the treated surfaces taste unpleasant, reducing the severity of gnawing damage, the University of Missouri Extension reports. Farmers and gardeners use Thiram on plants, and you can find it in garden centers.